Rallye Monte-Carlo. A prestigious event, that takes no Prisoners. The challenging twisty, technical mountain roads, which puts even the greatest drivers in the world to the test. The 2011 season opener of the IRC marked the centenary edition of The Monte. Famous for the unpredictable weather conditions out on the treacherous mountain roads, anything could happen. and 2011 was no different. Day 1 started out surprisingly dry, although that didn’t make it easy for any of the 120 drivers that entered. After the first 2 stages 21 had already retired, and many suffered punctures on the winding roads. Both Protons where out by stage 2, PG after taking off a wheel, and Chris Atkinson didn’t even make it 700 meters into stage one due to an electrical problem. 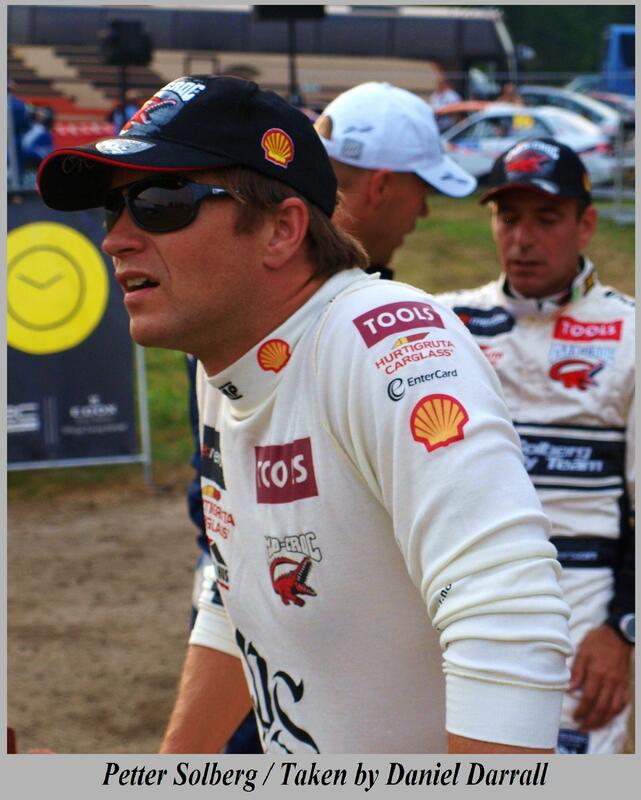 Mikkelsen retired on stage one after broken suspension and Henning out on stage 2 with the same problem. A further 9 went out in the final two stages of the day. But the real headline news was the unbeatable pace of Juho Hanninen, who after 2 stage wins, put him in the top spot at the end of the day, with a lead of 44.5 seconds. With ‘Fast’ Freddy Loix in second spot after winning the final stage. WRC’s Mr Hollywood, Petter Solberg finished in 3rd after saying he made a small mistake and it was a little slipery, but was ‘loving it’ out there on the roads. Stephane Sarrazin finished 4th with Britans Peugeot UK driver Guy Wilks in 5th. The morning of Day 2 started much the same as how Day 1 ended. But with the scenery in a frosty coating in temps of -5 degrees. On the dry but slippery roads, Petter swapped positions with Loix to grab second by mid-day service after 2 second fastest stage times. But while the Crews where in service, the Monte took a turn for the worst for the drivers. 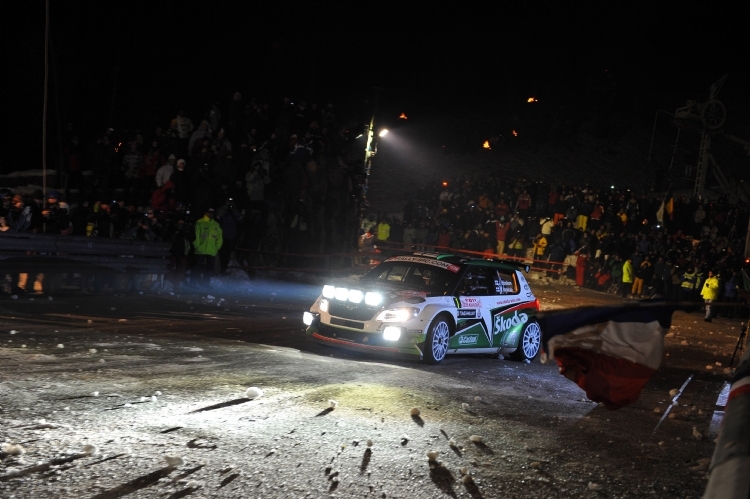 And the final two stage’s showed what the Monte is all about. In the 100 years that the event has been going, it once again proved what an unpredictable and challenging test it was to any who attempted to conquer it. At mid-day service, the crews were in disarray trying to decide which were the best tyres to go out on for the last two stages of the day. Delecour choosing 4 Studs with snows in the boot and Bouffier taking a similar choice but with 4 snows an 2 studs in the back. Solberg went for a safe option of 4 cut Inters and 2 snows in the back – Hanninen and Kopecky followed suit. Wilks went with snow all round. Loix took 4 snow, and 2 inters in the boot. And at the other end of the ‘tyre scale’, Maurin and Vigion both went for Slicks. The drivers left the safety of the service park, and that was when the Monte bit hard. The weather and tyre choice totally shook up the leaderboard. The cars struggling to find grip on the freshly fallen snow. Hanninen dropped down to 4th, Petter dropped to 7th. And the new top 3 were Bouffier, Sarrazin and Loix. Then onto the snow filled final stage. By this time, most of the field realised their choice on tyres was wrong. But the 1994 Monte Carlo winner Francois Delecour showed his experience and knowledge to take the stage win by 27.1 seconds to move from 8th in the morning to 2nd overall. With everyone else sliding and spinning off the road in all directions, much to the excitement of the rally radio reporters Colin Clark and Julian Porter, and to the many fans around the world, watching at home the action ensued live on Eurosport. Guy Wilks did a great job to over take two struggling slick wearing cars on the stage and was 4th fastest, but beating him on the stage in the Subaru impreza was Florian Gonon. Norwegians Petter Solberg also showing how important tyre choice was, by this time losing over 3 minutes to finish 7th overall. So after the mix up thanks to snow and tyres Day 2 ended with Bouffier leading overall by 28 seconds, with Delecour 2nd. Freddy Loix got the bottom step of the podium 37.5 behind. Britain’s Guy Wilks 4th, Circuit racer Sarrazin managed 5th. Original leader Hanninen dropped way down the order to 6th and Solberg 7th. Day 3 And it was a welcome sight for most to see the sunshining and the roads dry. After just the one stage in the morning everyone was pushing to make up for the time lost yesterday, with no position change. After service, the crews await for the final 4 evening stages. 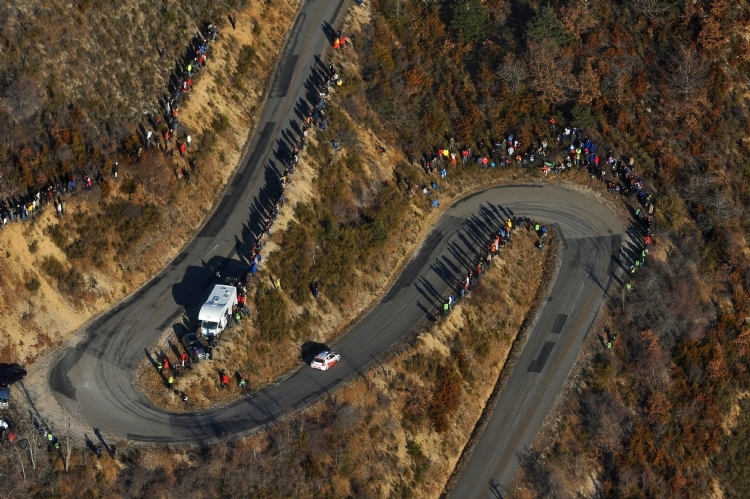 The next stage being the infamous and most challenging stage in Rallying, the Col de Turini. On the fan flooded and mostly dry but slippery stage, Delecour dropped to 3rd and Sarrazin moved to 4th, then straight onto the Lantosque stage were Sarrazin struggled due to his Gearbox stuck in 4th, luckily most of it was down hill and only dropped back to 5th overall. Bryan Bouffier still leading now by 47.7, it was back to service before hitting the final two stages. On the re-run of Col de Turini, Sarrazin took the stage win thanks to his gear box change and got back 3rd. Guy Wilks dropped to 5th after changing the car and making it to soft. Ex-F1 driver Alex Caffi showed off to the crowd by a failed attempt of doing a 360, which turned into a 3 point turn, but still delighted the snow ball throwing fans. Then onto the final stage. Sarrazin again took the stage win, Hanninen 2nd fastest showing what he could have done if it wasnt for the snow. Bryan Bouffier was only 9th fastest, but it was enough to Grab the win overall, and put his mark in the history books on the centenary edition of the Monte Carlo Rally, saying “It’s fantastic, really fantastic! I’m so happy, for Peugeot, for the team. Lots of emotions. It’s really amazing. It was really tricky rally, but Peugeot gave me perfect car, I’m happy for them!” Freddy Loix got 2nd place, And sarrazin won 3rd. Wilks, Delecour and Hanninen got 4th, 5th and 6th, with Petter finishing 7th. However, after the final stage, the action still wasn’t over. Petter finished the final stage with Alternator Problems and didn’t make it back to the final time control. He broke down just 12Km away from service and after completing every stage of the rally, he had to retire from the Rally on the final Road section. Also, Stephane Sarrazin checked into final time control late, receiving a penalty dropping him to 4th, which promoted Britain’s Peugeot UK driver Guy Wilks to the final step of the podium. 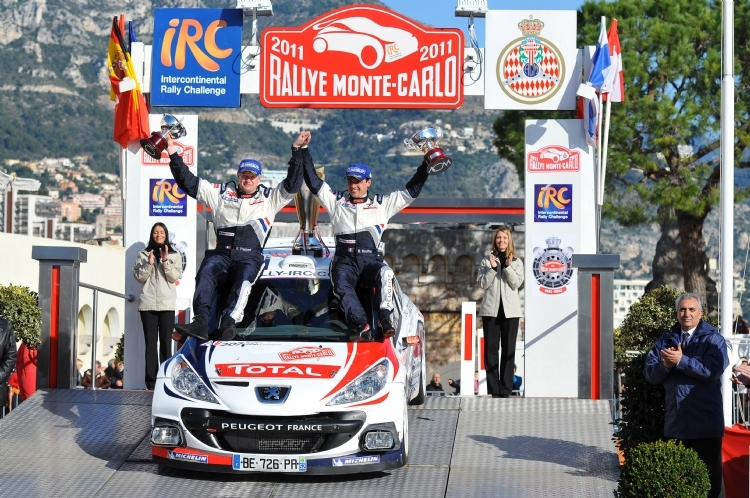 This entry was posted in Other Rallies and tagged 2011, IRC, Monte carlo, rally. Bookmark the permalink.